In the end, the race was so long that I really could not manage to write a report afterwards. It's back to post-race talking points for me! And there were plenty of them. To begin with, many are saying that the race should have been canceled, weather conditions were so atrocious. But that ignores F1's stated policy of "the show must go on" - even if it means an entire race run behind the pace car, servitude to the great god television means that cancelation is out of the question. We have no-one to blame but ourselves for this attitude. It is older than Bernie's reign so, for once, we can't blame him; instead we must look to our belief that wet races are the best because they mix up the order and give the really skillful drivers a better chance. On Saturday, everyone was hoping for a wet race to break up the procession we've come to expect this year - we can't turn around now and say they shouldn't have raced. So the race was going to be run whatever happened, safe or unsafe, with or without helicopter, whether or not the drivers could see (they always say they can't see in wet races anyway - the only way to avoid that is to stop racing in the wet at all and how many of us want that?). And let's face it, that was one entertaining race. The matter of Ferrari starting on intermediates when the race stewards had issued instructions that all cars should be on full wets was a classic case of a gamble that did not pay off. No doubt the idea was that a dry line would appear and then Kimi and Felipe would have had an enormous advantage as a result. It was a very optimistic strategy, however, and meant that Ferrari ruined their drivers' chances of winning; somehow I feel that it would not have happened had Ross Brawn been there. As to whether the team were informed in time of the stewards' decision, well, fair enough, I'll believe that somehow the message reached everyone, including the TV commentators, before the start of the race but not Ferrari. They paid for the error in having to change to full wets anyway, but I wonder if the excuse would have been accepted had it come from any other team. The race also raised a question regarding the new policy of having tarmac run-off areas, rather than gravel traps. Almost everyone had an off at one time or another but very few paid the price. They just drove back on again. Now, that's all very well from the safety point of view but there were a couple of incidents that highlighted the unfairness from a racing point of view. Once again, Ferrari provide a good example of the inconsistency of the rules in this area. 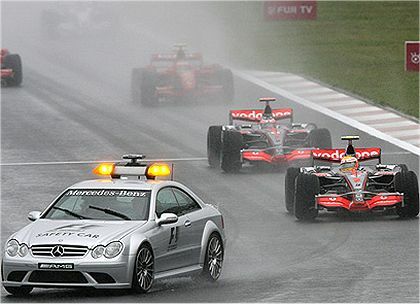 Massa was handed a drive-through penalty for having passed Heidfeld by going off the circuit during the safety car period. In the circumstances, I thought that was a bit harsh and that an instruction to him to let Heidfeld through would have been sufficient. But much later, during the Massa/Kubica battle on the final lap, Massa passed by going off the circuit and being able to accelerate earlier than Kubica as a result. Nothing was said about the legality of the move but I think there is a case for extending the "cutting the chicane" rule to cover these new run-offs. The wider line gave Massa a clear advantage in the race to the line, yet it was obtained off the track; how can that be allowed? If it remains legal, we will see the limits of the circuit extending into the run-off areas, rather as Mansell invented a new line through la Source hairpin at Spa one year (it worked well enough to become standard practice in following years, eventually being incorporated into the circuit). It is quite clear that the new run-offs can provide an unfair advantage. They need to be retained for safety reasons but it seems to me that a driver should never benefit from what is, essentially, a mistake. And the solution is quite simple: the rule should be that any driver having to use a run-off area must rejoin the circuit at the point at which he left it. End of problem. There were so many other points of discussion that I must leave them for another day. Instead, I want to give the race winner his due; Lewis Hamilton drove an impeccable race in extremely difficult conditions, his one spin was the result of a tap from Kubica, and we really should stop calling him a rookie. Whether we like him as a person or not, he has done enough this season to thoroughly deserve to be champion. I would still like the improbable to happen and Kimi come through at the last, but the reality is that Hamilton has little to do but finish the final two races to win the title. At Fuji he showed that he is worthy of it. I strongly agree about asphalt runoffs- I thought they were great at Turkey, and to be frank, they did their job in Japan, but in Japan and in Spa as well, there were many offs that would have ended races if a different surface was there. My suggestion to remedy the situation, but still have the relative safety of asphalt to apply brakes upon, is to make the curb higher, and the grass segment a half-meter wider and deliberately deeper than the tarmac surface on the other side. The object is that we want to see a suspension component break when the runoff is hit, in such a way that the driver can still brake to safety, but the car should become undrivable. Rejoining the circuit where it is left is not a bad idea on paper, but finding the exact spot would become a job for the stewards, whom I don't expect to make good decisions about that sort of thing. You may have cars reentering the track into blind sections of a corner, or directly into the speed line! In a series like GP2, I'd think perhaps forcing a car to hold long enough to lose a position or three would suffice, but in F1 that would appear contrived. These runoffs are already adequate for motorcycle racing; I've seen quite a few examples where even a little slip onto the grass will pretty much lose the driver a position or two, and it doesn't take a lot to ruin a rider's day. In fact, after watching a recording of Valentino Rossi having his day messed up in Japanese rain, I should have known F1 would be messed up by rain too. These days, it seems F1 races need to be messed with if they're going to be at all interesting, Chunter! But it's obvious we're agreed that no advantage should be gained from having to use a run-off area - the problem is how to ensure that there is none. I'm not sure your suggested solution is ideal - I have visions of a car breaking its suspension as it leaves the track and then becoming undriveable at speed. You know F1 - something like that is bound to happen sooner or later. Probably the best solution is the chicane rule - you pass anyone through going off track, you have to let him through again. So, Hamilton is worthy of the drivers championship. On skill alone, perhaps so, but should the car he’s driving still be instrumental in earning points towards the driver’s championship? I’m afraid I’m going to ruffle a few feathers here in saying that it should not. That McLaren were found to be in possession of Ferrari material was sufficient to ban them from the constructors title. True, the accompanying fine was excessive, but until all penalties are carved in stone, such absurdities will continue. That the car benefitted and the drivers knew of (or were using) this material is already pretty clear, thus the same penalty should apply. Why didn’t it? Exclude McLaren completely, then watch the track attendance and TV audience decrease accordingly. Conversely, few care much about the constructors title, and a fine of such magnitude served F1 marketing well in way of free advertising throughout the entire news media. There are indications that Hamilton has already been chosen. The bump with Kubica was, on merit, a racing incident at best, and under those conditions to accredit blame is to serve notice that anything resulting from a serious challenge (except an unlikely, perfectly clean pass on Hamilton’s superior machine) will be penalized. A similar exalted status was enjoyed by Senna on track (with Prost being the primary victim), till Schumacher’s arrival caused a transfer of this preferred status. After following our sport through much of a lifetime, I too am counted amongst those who contemplate seeking a more deserving venue to occupy the limited years remaining. The deteriorated circus is cause enough, without being forced to listen to James Allen’s inane babbling drown out Martin Brundle’s more qualified opinion of what is taking place. Yes, Murray Walker made mistakes ... but that he was entertaining cannot be argued by any reasonable standard! Martin Brundle brings first-hand comment to the fore while that James fellow simply spouts forth the 'party-line' of TV and the tabloid press. Get him out of there! Further.. A battle royal is gong on twixt 2nd & 3rd place during the last lap and ITV coverage only showed the lone figure of Lewis out on his own; Almost ignored was the mighty battle Massa was having with Kubica save for a few measley seconds! Do the TV Producers have no heart? I've had my say about what I think of the WMSC verdict, David so won't get into discussion on that one. But the reasoning for penalizing the team but not the drivers is that the charge was "bringing the sport into disrepute". This doesn't mean that McLaren have been proved to be using Ferrari technology on their car and, until that is proved, the car is legal. Theoretically therefore, the drivers have no advantage from what went on. And anyway, they were granted immunity by the great god Max. Your reasoning as to why things are as they are is much closer to the truth, no doubt, but the FIA can't just openly admit that, can they? I agree with you that the Hamilton/Kubica coming together was a racing incident and warranted no penalty but these days it seems there's an unwritten rule that one must not mess with the stars. Being in the States, I am not subject to the utterances of James Allen and, judging from most reports of his style, I am counting my blessings. Brundle is great but I must admit that Murray Walker used to irritate the life outa me! Mixing metaphors is an art form, Fractal, and the proof of the pudding is in the eating thereof! It was a great race with lots of interest. A shame that it has to be rain that is the only way for such an event to happen these days. I must agree that a wet race is very enjoyable. The racing was fun to watch. I am sure it was not so fun to drive. I also agree that TV rules when the decision to race is made this is because of how we spell $afety. Ferrari tire decision would have been deemed briliant under other circumstances. I feel that Hamilton showed us just how good of a driver he truely is. The run off area is an issue that must be worked out. Intentially breaking a piece of the suspension is not the answer. Neither is making the stewards responsible for re-entry. It is obvious that no one should be able to advance position using the run-off as Massa did. But think how many cars would have been on the track at the end had the run-offs been gravel. I also would enjoy Kimi in the mix but to quote the Stones "You can't always get what you want". Still as a fan it was enjoyable to watch. Now my thorn with the ITV feed is the same as always. Much of the good racing during the race is not with the leaders but in P-5 through P-15. They show some of this racing but I do not think enough. Today it was hard for any producer to catch everything. They did try. We all saw Massa in the run-off. In the end it was good to see a new face on the podium. You're quite right about the tire decision, John. At Spa, everyone said what a brilliant move it was to put Winkelhock on wets while everyone else was on dries. In point of fact, it wasn't - it was just a gamble that paid off. Had the rain stopped instead of getting worse, the Spyker team would have looked stupid. And another good point about racing in the midfield - it is invariably better than at the front (whether it's wet or dry) and we rarely see much of it. The TV directors are getting better, however; I can remember a time when we were shown the leaders only and the others were completely ignored. In fact, now that I think about it, the quality of TV presentation of F1 has improved out of all recognition over the last thirty years. We get in-car shots, cameras whizzing along rails alongside the track, interviews with the drivers (well, alright, a few brief platitudes), all sorts of extras. It can get better, yes, but let's also remember how bad it once was. A number of years back there was a CART race at Laguna Seca. Alex Zenardi was in p-2 with Al Unser Jr. in P-1. At this venue is a chicane that changes altitude. It is really blind on the approach. All drivers know it is there. Zinardi needed the win for championship points or the outright championship. He cut the chicane and passed Little Al winning the race. The commentators said it was a brilliant pass. It was cheating but it held. It took some thing like this for CART to adjust their rules accordinly. The run-off issue needs to be addressed now this week. Because of today and the ability for cars to stay on the grid longer, owners will want asphalt run-offs on more venues. This issue must be decided upon before this. I remember the tire issue with Winkelhock. The commentators had it appear to be genius when in reality it was luck. I am also very concerned about Hamiltons' safety around Alonso. Is it me or does Alonso appear to be a bit unbalanced. At these speeds death and injury are a serious subject. Hamilton needs to protect himself anyway he can. As an aside here- can Alonso have a teamate that is competitive? Clive you are correct about ITV coverage. Just a few years ago they showed only the leaders so they have come some way but they need to go further. They could have capitalized on the story about the factory Hondas being outraced by the customer teams. Do you mean the Corkscrew? I reckon anyone who is brave enough to try a pass there deserves to win, however he does it! But seriously, I think you're right - if the FIA doesn't address the run-off issue quickly, there will be all sorts of controversial overtaking moves in the future. I don't know if Alonso is unbalanced. He seems to be able to appear as cool as ice one moment and then says something that gets everyone riled the next. Maybe that shrink of his is teaching him a few tricks. As for Fernando getting on with anyone who is as quick as himself, I doubt it. He wants the Schumacher sort of arrangement, I think. Wow! A lot of good reading this morning (the day after the race). Gleaning from this (and other sites) one topic that seems to have everyone's hackle's up is the random and arbitrary penalties the FIA spits out. Massa's drive thru was un-called for, merely give back the position would have and SHOULD have been appropriate. Likewise Kubica touching precious Hamilton......gimme a break......a minor incident at best and oddly neither car changed position and both continued. Considering the conditions there was no "racing line". That penalty was un-justified. Where is common sense these days? TV coverage?.......I'm in southern Virginia USA and have to listen to another drone named David Hobbs. I enjoyed him as a driver but put a microphone in his hand and he's deadly. Did anyone see how NASCAR handled the rain soaked race in Kansas yesterday? A lot less controversy over that race. I didn't see the NASCAR race, Number 38 - it's rare that I manage to catch them. Will have to start making a note of when they're on. I think Massa didn't have a choice, to me it looked like Kubica had not given him any room coming off the last turn, just good racing. Overall though, something must be done. As for Vettel, I don't like that he replaced Speed, but he is something special. Does anyone have his address, I feel bad and want to send him a card or something. I looked at Vettel's website but it's still under construction and only the German version shows. There didn't seem to be an email address either but you could try contacting him through the Scuderia Toro Rosso website. They would pass it on to him, I'm sure. Massa did get an advantage by using the run off, I will not debate that, its that he was forced out that is the issue. Had he gone off on his own to keep his momentum up, that would be an unfair advantage. That being said, I'm afraid a rule to penalize anyone who goes off is a little too vague and can be interpreted wrongly. This would mean that anyone on the outside of a turn would be at a complete disadvantage. The person on the inside would have the right to his racing line and not be penalized (as seen this year at Spa) and the person on the outside would be for going outside the track. Had The Ham gotten around Alonso at Spa would we be having this conversation? I agree that we need less complication, not more, Dan, but it seems to me that without some sort of rule, the run-off areas will become extensions to the track - to be used when they give advantage. That needs some sort of policing that is not the opinion of the marshals. Something like: If you have all four wheels outside the curb, you are adjudged to be off track? That should be easy enough to prove one way or the other (although it might lead to some interesting attempts to keep one wheel just inside the curb, I admit!). normally the grass should be slower than the track :-) so under normal circumstances Massa would probably loose out to Kubica.. Agreed, Milos - but that's why the new tarmac run-offs are a problem. Clive, I thought the existing runoffs already have the chicane rule, though I can't produce evidence printed in the rules yet. My point though is that if a car has an off it should pretty much be out of the race. I dare to say, less cars on the track would have made Japan more interesting, even if the field only had some six or seven cars in it when it finally classified. Anyone that played video arcade games in the 80's knows that if you don't take the hairpin just right, your car will explode against one of the "Shell" signs... but for now I digress. Number 38, David Hobbs is weak, but at least he's not Peter Windsor. Sometimes it's funny watching Peter get pushed around by other members of press and otherwise, watch people on the paddock refuse to tell him anything useful. John has a good memory, Zenardi put all four wheels off on a very dangerous corner to make his move. Zenardi is a testament to bravery in motorsport, as well as danger in motorsport, as you may recall that Zenardi no longer has the lower section of his legs, having lost them in an accident that really wasn't anyone's fault. I believe he still races in WTCC. I'm not sure about the chicane rule applying to run-offs as well, Chunter. Wouldn't there have been more fuss made about Massa's off in that case? And I don't think he was the only one to get an advantage from using the run-offs at Fuji. Peter Windsor is just embarrassing behind the mic. I watch with a sort of morbid fascination to see how ineffectual he can get. Maybe BMW didn't put up a fight about Massa's pass for fear of being thrown out of the championship. "You would have to be an idiot to try that" makes for a great sport. I think there's a limit to the amount of safety you can provide in a sport like F1. Innovations over the last twenty years or so have made a huge difference and it gets close to the state of "enough is enough", in my opinion. You're right that, if you remove all the danger, the sport loses its edge. I think BMW didn't raise the question of Massa's pass partly because it was Kubica that forced Massa off and also because they're not going for a championship anymore. It no longer mattered enough for them to protest. Dan M, that kind of racing still exists in WRC. I am not the only one to openly say I thought McRae would die at high speed in his rally car. Rally is not television friendly, and they race for times, spaced a good five to ten minutes apart, so there is no overtaking. Can't complain about the variety of scenery.